Are Cost-Increasing Production Practices in Agriculture's Future? The friendly voice that has greeted callers and visitors to CARD for the past five years belongs to Jackie Garreau. Jackie is the CARD receptionist and secretary for Assistant Director Keith Heffernan and for Professors GianCarlo Moschini and David Hennessy. 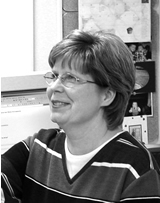 Jackie worked at Guthrie County Hospital in her hometown of Guthrie Center, Iowa, for twelve years as a medical transcriptionist, medical records coder, chart reviewer, and records clerk before she and her husband, Leo, moved to Ames in the spring of 1997. Jackie joined CARD in August of that year. Besides her other secretarial and administrative support duties, Jackie is in charge of communicating employee news through CARD's two bi-weekly email posts: InsideCARD and CARDEvents. She also handles the paperwork for personnel matters�with its wide variety and complexity of forms and checklists�and makes sure that every detail is attended to. She can often be seen making a dash to the dean's office in Curtiss Hall to get a signature or push a form through to make a deadline. Serving at the front line for contacts seeking information or trying to make a connection to the faculty and staff at CARD is one thing Jackie says she appreciates about her role within the organization. "I enjoy handling calls, and getting to meet people from various organizations and other countries," she says. Jackie can be found helping wherever there is a need. She often works at CARD-sponsored conferences such as the Ag Forum, assisting with registration. She also regularly helps staff with their travel plans, creates mailing lists for publicizing special events, inputs data about CARD publications for an online database, and helps with the hosting duties when CARD receives special guests. At home, Jackie looks forward to time spent ith her husband of 29 years, her two daughters and sons-in-law, and her two grandsons. "I enjoy being with my grandsons and family, and, occasionally, traveling." A third grandson was welcomed to the family October 8. Jackie also likes to sew and shop in her spare time. ?